At Extreme Comfort Air Conditioning and Heating Commercial Air Services, we take pride in keeping your office working. We service all makes and models of Commercial Heating and Air Conditioning units including Carrier, Trane, Lennox, Rheem, Mitsubishi Electric, York, Goodman, and many others. If you have questions about your brand, please contact one of our Extreme Comfort Commercial Advisors today. Commercial heating and air conditioning systems are one of the biggest investments a company makes, so Commercial AC Service and Maintenance for your office air conditioning and heating system on a regular basis is important. 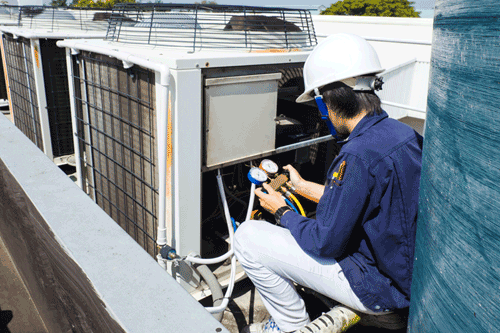 Commercial air conditioning and heating manufactures require annual check-ups to keep your warranty valid. At Extreme Comfort Air Conditioning and Heating, we provide annual system check-ups to maintain your manufacturer’s warranty. These commercial air conditioning and heating system check-ups also enable us to identify minor problems (like small refrigerant leaks) before they lead to expensive repairs (like a $6,500 compressor replacement). In addition, properly maintained commercial heating and air conditioning equipment runs more efficiently, which can save you money on your energy bills. *Commercial AC Service Maintenance agreement paid in full upfront. Call for additional unit pricing. Air Filters not included. Questions? Contact our Extreme Comfort Advisors for details @ (972) 234-2336 or use the form below. Whether you need a new equipment or service on an existing unit, we employ NATE-certified technicians so you can always feel confident that the job will be done right the first time. NATE-certified technicians are skilled professionals who have proven their knowledge in the HVAC/R industry by passing specialized NATE certification tests. Extreme Comfort Air Conditioning and Heating employees technicians certified by the Texas Department of Licensing and Regulations. TDLR regulates contractors who install, repair, or maintain air conditioning, refrigeration, or heating systems. We always pull permits on new unit installation which means your city or county inspector will be certifying our work after we are done. Most HVAC companies don’t want to pay this expense, we do. It is important to us that you are confident in choosing Extreme Comfort Air Conditioning and Heating to serve you. Click here to view the number of permits pulled in your area of Dallas.